Ummmm, she didn't really like it . 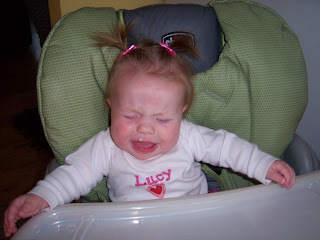 . .
She cried or spit it out or tried to console herself by sucking on her tray . . .
She looks so grown up! When did that happen? Here's a suggestion: instead of mix or water, mix the rice cereal with high-fructose corn syrup. Kids love that stuff! Mix the cereal with whatever milk you give her regularly be it breast or formula. Also it looks really thick in the pictures. It's probably triggering her gag reflex. Make it really thin. Like a thick soup. They have to get used to the texture as well as the taste. And of course persistence. Good luck! She is darling! I have no idea, but that video cracked me up. Oh my goodness, how cute is she?!! haha cute. claire was never too crazy about the cereal either. i suggest applesauce or mashed bananas mixed in, both are easy on the tummy, unlikely she's allergic, and sweet. claire used to love that. Zion was for some reason unable to digest food of any sort until about 10 months old. Clive started eating everything at 5 months. Every kid is different. Both of mine hated anything "babyfoodish". I say until they want it, which means grab your fork/spoon and headdive towards your plate, don't bother. 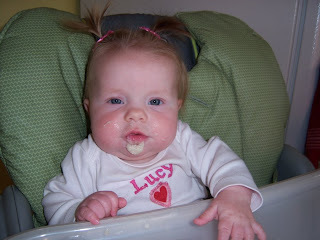 Baby foods (including the various cereals) are generally a waste of time & money. :o) that's my not so humble opinion!